Silcox Hut is a rustic stone and timber structure built in 1939 by the WPA and the CCA. These federal government programs built Timberline Lodge as well as other stone and timber bridges, stone retaining walls, dams, highways, parks and other projects intended to have long-range value. 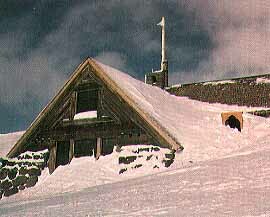 Silcox Hut, named after Ferdinand Silcox (Chief of the USFS in the '30s), was designed to be the upper terminus and warming Hut for the Magic Mile Chairlift, the second chairlift in the United States. In 1985, Silcox Hut was put on the National Register of Historic Places and the Friends of Silcox Hut was established as a non-profit group.